A glimpse of the latest class of America’s Cup sailboats skipping across waves at speeds up to fifty miles an hour offers a vivid reminder of how far sailboat technology has advanced since the square riggers of the Spanish Main. In fact, the new racing boats have more in common with aircraft—look no further than Oracle Team USA’s partnership with Airbus to design its 2017 America’s Cup entry. Not quite so space age, but no less impressive, are the top level of super yachts, the high-seas playthings of the world’s wealthiest, providing a level of privacy, security, and decadence available nowhere else on earth. 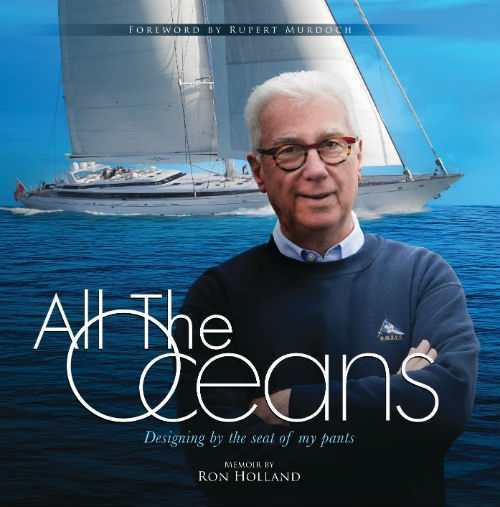 For a sense of the way these yachts are commissioned, designed, and built, sailing enthusiasts can now turn to All The Oceans: Designing by the Seat of My Pants, a memoir by legendary yacht designer Ron Holland. Holland’s New Zealand beginnings were as humble and removed from rarefied circles as imaginable. But through extensive sailing experience in nearly all the top international yachting races and a fearless approach to design, he eventually found himself answering calls to build sailing yachts with budgets in the tens of millions of dollars. Mirabella V, for example, the world’s biggest single-masted, fiberglass composite sloop at 247 feet, with a 297-foot mast, posed such a lengthy list of design challenges as to be “preposterous,” he writes. But with $60 million to work with, he had ample time and resources to bring the project to completion. Holland is a congenial storyteller and skilled writer, and his lifetime of achievement is as admirable and impressive as it is entertaining.